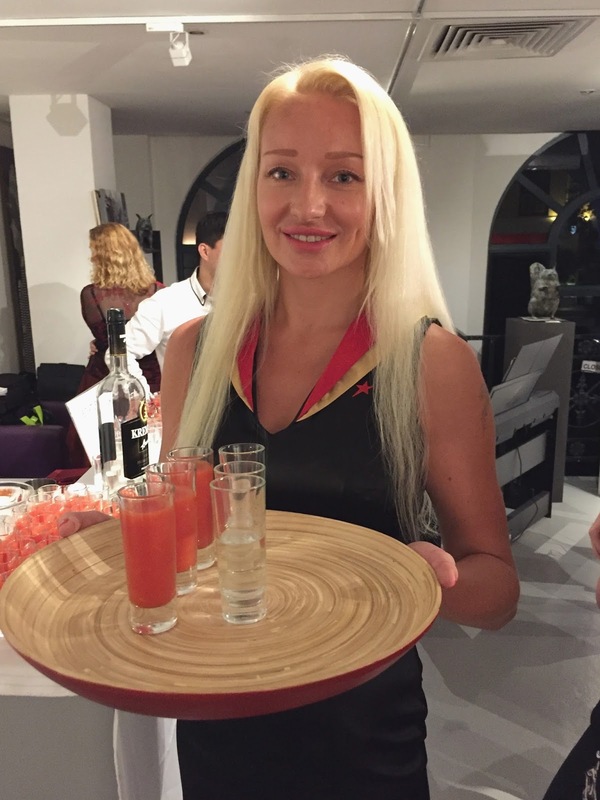 ... if you wish to try sips from Russia when in Singapore. It was an art show located in a gallery at Armenian street. The exhibit showcased works by Russian artists. 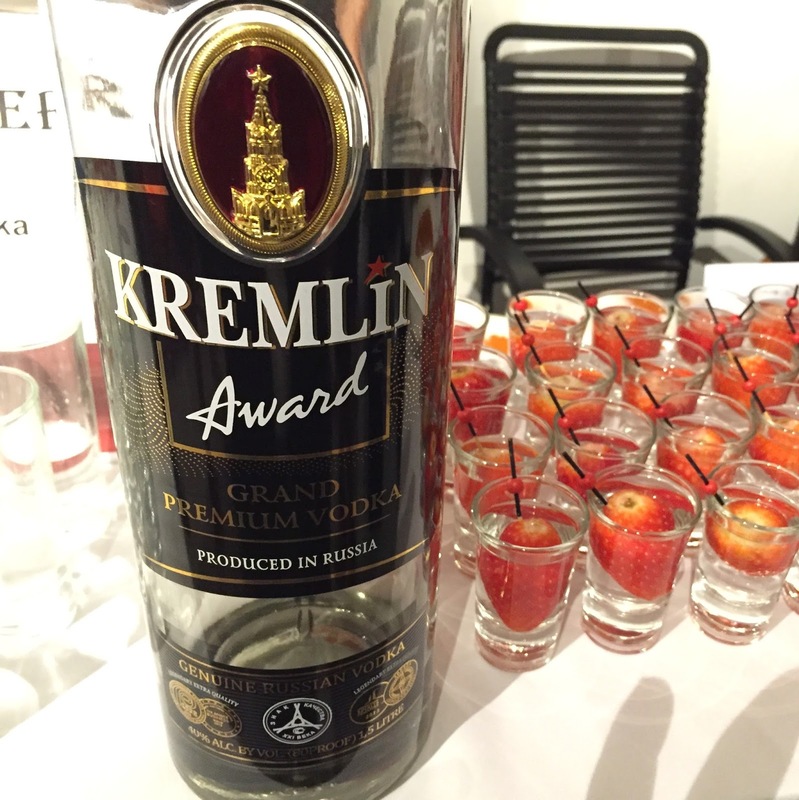 True to good form, guests were introduced to sips from Russia during this event. Though Russia has a long history in winemaking, it nevertheless faces challenges in making quality wine with an international appeal. Despite hurdles, some producers are striving to make their mark on the international wine scene. One such producer is Abrau-Durso winery. 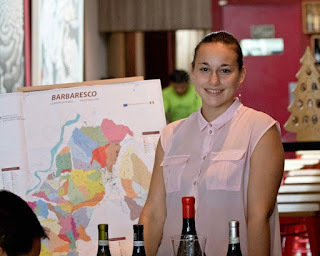 I've had the opportunity to see their wines exhibited at Hong Kong Wine & Spirits fairs (an event held annually in Hong Kong). 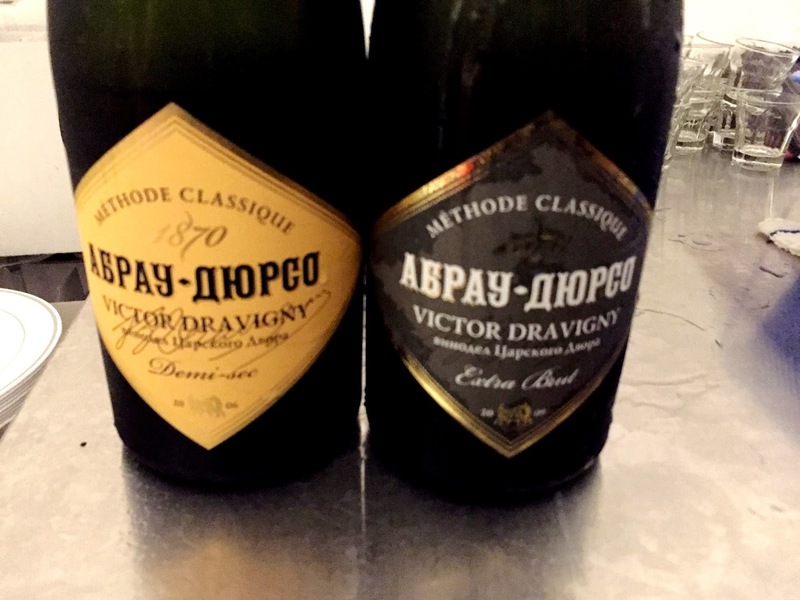 In Singapore, the Abrau-Durso wines can be found at Buyan Russian Restaurant & Caviar Bar at 9 Duxton Hill. Two sparkling wines from Abrau-Durso winery were showcased during this art event: one the sparkling white demi-sec and the other an extra brut. According to the sommelier at hand, the demi-sec is made with Chardonnay, Pinot noir and Pinot blanc varietals; while the extra brut is made using Pinot noir and Riesling varietals. Both were made in easy, refreshing styles exhibiting a leaning towards fruit flavours like citrus and apple notes (as opposed to mineral or autolytic character profile). 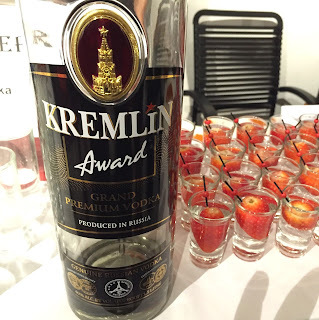 An interesting spirit came in the form of the Kremlin Award Grand Premium Vodka as well. I must confess that I am not much of a 'spirits' drinker. To this novice, it came forth as an approachable sip with pleasing flavours and an enjoyable texture when tasted neat. The good host nevertheless ensured the presence of strawberries and tomato juice as accompaniments for those inclined. There’s wines produced by Domaine Leflaive and there’s wines produced by Olivier Leflaive; Jean Soubeyrand patiently explained to a question posed to him. 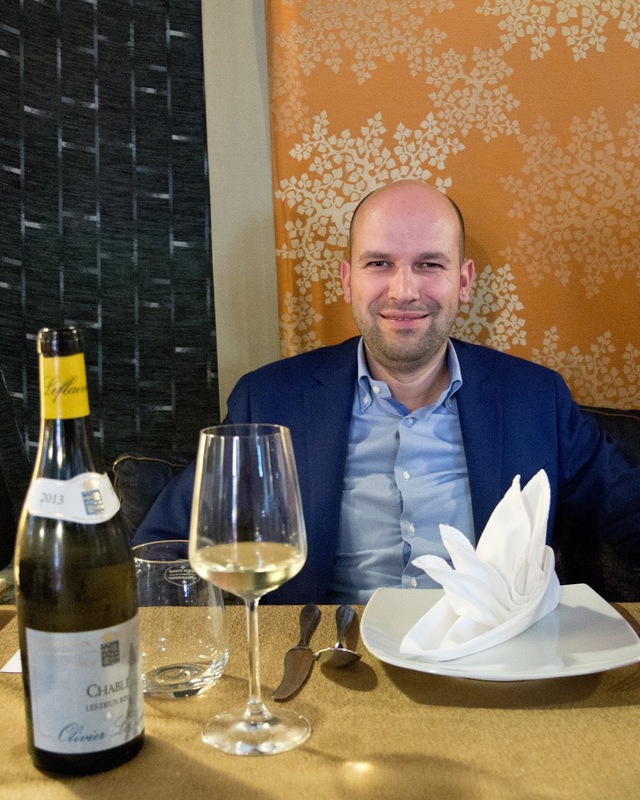 He was in Singapore recently to share about Olivier Leflaive’s negociant business and wines. Olivier Leflaive had the good fortune to witness, learn and experience viticulture and wine making since young. His grandfather, father and other family members were involved in things related to viticulture and later wine production (with the purchase of the family vineyard in Puligny-Montrachet back in 1905). In 1984, Olivier Leflaive went on to set up a negociant business. But unlike negociants who would have been content with trading in completed products, he however preferred to make his own wines. Initially he bought grapes from reliable growers and began making wines under his own label. Later he acquired parcels of vineyard land and included grapes from his own land for winemaking as well. With Franck Grux as his winemaker (since 1988), not only was he able to produce and provide quality wines to a growing market; he was also able to expand his wine portfolio from beyond those produced within Puligny-Montrachet to include those made from other parts of Burgundy as well. A few sound initiatives introduced over the years have certainly went on to enhance customer experience and product awareness towards his wines. Olivier Leflaive set up a hotel (La Maison dÓlivier Leflaive) in Puligny-Montrachet where folks can come, stay and spend some time in the commune. It helps people to get to know his wines better and goes to promote tourism in the commune as well. Visits are organized to his vineyard and winery to explain viticulture and the wine making process to curious wine enthusiasts. There's also wine tasting workshops to educate people on his wines, and dining experiences (at his restaurant, La table de Olivier Leflaive) which showcases wines from his portfolio. Locally, if you are keen to get more information on Olivier Leflaive wines, you can approach Enoteca at Tel:63371263. For the inquisitive wine drinker. A white wine called ‘Yellow wine’ (Vin Jaune) from the Jura wine region of France. Though by and large white wines try to retain freshness, youthfulness and fruit notes; the vin jaune on the other hand embrace and display a partially oxidative character . They are certainly not the sort of whites produced at large in other wine growing regions of France or across the world. A little unique in style and certainly an acquired taste for the local wine consumer in Singapore. 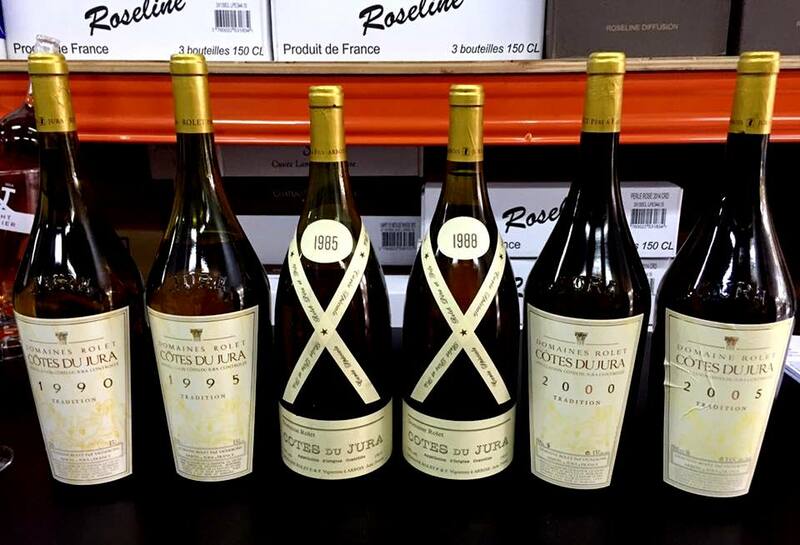 I had the opportunity to taste yellow wines from Domaine Rolet (Jura, France) recently at Vintage Wine Club (a wine company located at 49 Jalan Pemimpin). The colour in fact does not make one sit up and take note; I believe wine consumers are used to seeing white wines come in different shades (from colourless to deep amber). But the nose will certainly make one aware of the difference a yellow wine offers when you bring the glass closer for a whiff. Antonin Pon (one of the founders of this wine establishment) explained that unlike regular white wines which upon fermentation are aged with minimal oxygen contact (in order to preserve a wine’s freshness and fruit characters); yellow wines on the other hand are aged in partially filled barrels with a layer of yeast on the wine’s surface. It’s similar to the process a Fino sherry undergoes during its aging phase (but unlike a Fino sherry; yellow wines are not fortified prior to aging). This manner of aging (with partial contact to oxygen) results in the wine attaining a good shade of yellow and a degree of oxidative notes. Also, aging in contact with yeast makes the wine embrace aromas and flavours that the yeast imparts. One does not easily come across yellow wines in Singapore. Luckily, for those keen to see how older vintages perform, the Vintage Club carries back vintages of these wines as well (1985, 1988, 1995, 2000 and 2005). Apart from whites, Vintage Wine Club also brings in red and sparkling wines from Jura as well too. It presently carries more than 200 labels from different wine growing regions in France. Wine enthusiasts can attend free tastings held every Saturday (from 11am to 5pm) to learn about these wines.